There are many excellent business resources on the web but finding them is not always easy, and Google does not always come up with the best and most relevant. This is where gateways such as the ones compiled by the Institute of Chartered Accountants in England and Wales (ICAEW) come into their own. Their Library and Information Service have pulled together a number of guides on topics such as international company registration, SMEs, startups, country resources and industry guides. The guides cover official and unofficial information sources from the print collection of the ICAEW Library & Information Service and recommended websites on the internet. Some resources are for members only but many sections are open to all. It is worth spending some time working your way through the menus to get an idea of the range of information that is available. NORAD, the North American Aerospace Defense Command, and its predecessor, the Continental Air Defense Command (CONAD) has been tracking Santa since 1955. It all began when a Colorado Springs-based Sears Roebuck & Co. advertisement misprinted the telephone number for children to call Santa. The phone number put the children through to the CONAD Commander-in-Chief’s operations hotline. The Director of Operations at the time, Colonel Harry Shoup, had his staff check the radar for indications of Santa making his way south from the North Pole. Children who called were given updates on his location and the Santa Tracker was born. NORAD now uses four high-tech systems to track Santa – radar, satellites, Santa Cams and fighter jets. The Santa Cams “are ultra-cool, high-tech, high-speed digital cameras that are pre-positioned at many locations around the world. NORAD only uses these cameras once a year. 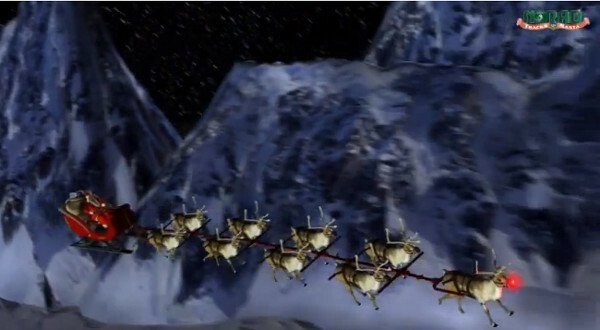 The cameras capture images and videos of Santa and his reindeer as they make their journey around the world”. Full technical details of all four systems can be found on the NORAD Santa site at http://www.noradsanta.org/en/how.html. In 2007 Google became an official NORAD Tracks Santa partner and provided the maps that displayed real time information on Santa’s location. This year, that partnership ended and NORAD is now using Microsoft’s Bing Maps. In response Google has launched its own Santa Tracker at http://www.google.com/santatracker/. It will be interesting to see how it compares with NORAD’s but straight away I have to query the quality of Google’s pre-launch information. On the “Learn more” page at http://www.google.com/santatracker/about.html the image shows not Santa as the central figure but a large snowman. Surely some mistake? Christmas has many traditions and one of the more recently established ones is the Christmas Price Index compiled by PNC Wealth Management. The 29th annual survey reveals that an improving US economy coupled with a severe drought that caused increased feed costs for large birds resulted in a 4.8 percent surge in the 2012 PNC Christmas Price Index. Based on the gifts in the holiday classic, “The Twelve Days of Christmas,” the price tag for the PNC CPI is $25,431.18 in 2012, $1,168 more than last year. PNC Wealth Management also tabulates the “True Cost of Christmas,” which is the total cost of items gifted by a True Love who repeats all of the song’s verses. True Loves must spend over $107,300.24 for all 364 gifts, a 6.1 percent increase on last year. Swans rose by 11.1 percent whilst six items (the Partridge, Two Turtle Doves, Four Calling Birds, Eight Maids-A-Milking, Nine Ladies Dancing and 10 Lords-A-Leaping) remained the same price as last year. The Three French Hens were up 10.0 percent and the Five Gold Rings soared 16.3 percent. As the only unskilled labourers in the PNC CPI the price for the eight Maids-a-Milking is represented by the minimum wage. With the US minimum wage flat at $7.25 per hour hiring the maids this year will not increase labour costs. For those True Loves who prefer the convenience of shopping online, PNC Wealth Management also calculates the cost of “The Twelve Days of Christmas” gifts purchased on the Internet. True Loves will pay a grand total of $40,440 to buy the items online, which is 1.5 percent more than last year and almost $580 more than this year’s traditional index. “In general, Internet prices are higher than their non-Internet counterparts because of premium shipping costs for birds and the convenience factor of shopping online,” Dunigan said. The full press release is at http://pnc.mediaroom.com/index.php?s=3473&item=133834 and the index itself is at http://content.pncmc.com/live/pnc/microsite/CPI/index.html. The site includes an interactive scavenger hunt where visitors can take a trip around the world to locate the 12 gifts of Christmas. “Five things you need to know about Google” has been added to the subscribers’ area of Search Strategies. Direct URL to the page is http://www.rba.co.uk/search/subscribers/GoogleFiveThings.shtml and the PDF (8 pages) is at http://www.rba.co.uk/search/subscribers/GoogleFiveThings.pdf. Top Search Tips List of search tips contributed by participants of my advanced search workshops. Google Search Tips List of tips for taming Google that have been recommended by people who have attended my Google workshops. Search Tools Summary and Comparison Table summarising and comparing a selection of the advanced search commands that are available in Google, Bing and DuckDuckGo. Google Custom Search Engine (CSE) How to set up a Google CSE to search selected sites. The November edition of Tales from the Terminal Room is now available at http://www.rba.co.uk/tfttr/archives/2012/nov2012.shtml. One of my Twitter network complained today that when they went to run a Google search a Google+ reminder for someone’s birthday popped up in top right hand corner. Google did the same to me prompting me to wish them a Happy Birthday. Does that remind you of another social network beginning with F? Yes, we were both signed in to our Google accounts and I have confessed on several occasions that I have sold my soul to Google. I have even gone as far as to sync all my data between my devices and my Google dashboard via Chrome. I made that decision knowing how much information about me that would give Google but I decided it would be worth doing. I can access my maps, bookmarks, searches etc. when I’m on the move and using my Android smartphone; and if my laptop dies all my Google and web browsing stuff can be quickly restored to a new machine. I still have another Google account that predates even Gmail but on the few occasions when I use it Google doesn’t so much suggest rather than demand that I upgrade to Google+. It requires a lot of effort, ingenuity and many clicks to say “NO!” Many of Google’s services and search features now require you to have an account and by default it may soon have to be a Google+ account. A reminder that someone in your Google+ circle has a birthday may seem a minor issue but as my Twitter correspondent said “function creep”. And there’s been a lot of that going on in Google search recently. Just when you thought you had sussed out the additional search options on Google’s results page Google decides to move them. Instead of appearing to the left of your results page the menu has been moved to the top, leaving a blank space where the old menus used to be. There are the usual options such as images, maps, shopping and videos and clicking on More reveals a drop down menu for News, Books, Places, Blogs etc. It begins to get confusing when you click on Search tools and an extra row of options appears. It is not obvious what the “The Web” does but clicking on it gives you two options. “The Web” is the default and I assume that to be the whole of the world because the second option for me is the UK. Presumably for those of you in other countries it will be your own country. The “Any time” option gives you the various time periods and custom time period by which you can limit your search. “Reading, UK” is my physical location and some results are personalised using that location. The location can be changed to another town or the country as a whole, as with the previous side bar menus. It is not clear what “All results” does but again clicking on it reveals the final set of search options including the all important Verbatim. As with previous side bar menus, the second level options change depending on which type of resource you are searching. For example, if you click on Search tools in Images there are links that take you to options that include size, colour and type. This change looks as though it is here to stay as most people in the UK are now seeing it and several of the country versions of Google I’ve looked at are also displaying it. All the old options are still there but it requires extra clicks to get to the same place and I sometimes forget what each link has underneath it. So those of you who, like me, run training sessions expect to spend the next few weeks updating your slides and training materials.